The Boston Marathon is one of my favorite races. I have been fortunate to run the race four times and qualify numerous times since 2002. I have completed Boston solo, with friends and in 2015 with family. It was my most memorable race yet. 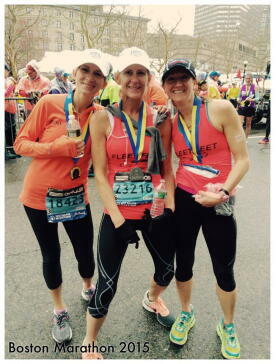 My mom had qualified for the Boston Marathon in 2013 and my sister qualified in 2014. This meant that both of their race times would allow them to run the Boston Marathon in 2015. Due to unforeseen circumstances, I had landed an entry in February 2015. I called my mom and sister immediately and said if I was going to pay and run this race again, it would only be if we ran the entire race together. They said yes, and so we were all signed up! I know we often talk about the training for a race, but not this time. This story is all about one day. I told my sister the morning of the race that it was going to be a “cell phone marathon”, and I was going to take pictures along the course. My sister thought I said “selfie marathon”, so I said ok, let’s do that instead. This is when the fun began. On April 20th, my mom, sister and I lined up at the start line in Hopkinton, MA. We had matching shirts on, that we had not planned, and matching throw away t-shirts – we are dorks. We started with this opening selfie at the start line. Of course, when we finally crossed over the start line it was 11:30am and it was raining, but we were determined to have fun! So, our first official stop on the course was when we saw the sign “Run Now, Wine Later”, so perfect for us. Who does not love red wine? That is my running motto! We decided that the person holding the sign also had to be in the photo, so I dug my phone out of the plastic bag and we shot this pic. As people laughed at us, we stopped for the “Team Jeff” photo. My dad’s name is Jeff, so this was our tribute to him. He was very proud and supportive of us all being there and running together. Oh – then we stopped for a marathon classic. “Smile If You Peed a Little.” Everyone does it. Period. Our next stop was “My Mom is a Rockstar”. How fitting? My mom definitely had some struggles qualifying for this awesome race! Her first marathon attempt was redirected at Mile 22 because a storm was coming in. Her second marathon was called at Mile 18 because of heat. And of course her qualifying race was gorgeous, but when you run 8:20 minute miles for the last 10k, you are bound to end up with medical attention. She cramped up BAD after crossing the finish line in 3:52. My son still talks about seeing Grandma on the ground that day. Next we approach the Wellesley girls. Wellesley College is a private women's liberal-arts college along the course. The women come out and cheer, and KISS you if you choose. The photo was taken with this sign “Kiss Me. I Believe in You.” Time for a photo, but no kisses for us ladies. Of course, we had to stop for the Yoda sign. “Do or Do Not. There is No Try.” My Ode to Cooper, my 8 year old son. Coffee is great before and after a run! We decided to take a picture with a man willing to buy us a Starbucks, but we thought drinking coffee during the race might be pushing it! This is a photo taken for my friends that can’t live without their daily bux. Watertown and Highway 16 – are we in Watertown, WI? That is my hometown and Hwy 16 runs through it. It was meant to be. “Chafe Today, Brag Tomorrow”. The later you are in the race, the more reality sets in. Hunger, bathroom stops, fatigue and chafing, especially in rain. “Toenails are for Sissies”. None of us lost a toenail, but I am sure a lot of Boston runners did, since the course offers a lot of down hills, in addition to rainy conditions. Ah – our next stop was with good-looking local firefighters. Enough said. I was told to keep this one out of the blog, but “F*** Yeah” is appropriate as you near Mile 20 in a marathon. Come on - you are either saying it out loud or in your head. Newton Mile 20 was our first mile marker picture. The miles were flying by as we took in the “selfie marathon experience”. 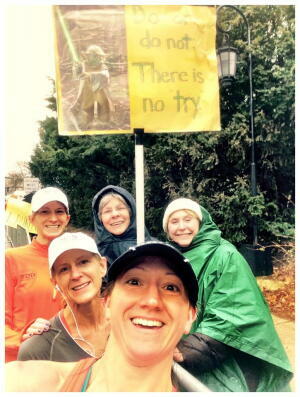 “Top of Heartbreak Hill – You Got This!” was our next sign photo stop. This was funny, because like every time, you say “That was Heartbreak?”. The five miles that lead up to Heartbreak are the challenging hills! Of course, my mom and sister enjoy hills, so they really did not notice. My sister had qualified on a course that was downhill for like 14 miles, then a hilly out and back. Some people. At Mile 24, we did not stop for a photo, but we walked and talked for a bit. Up until this point we had stopped for photos and had laughed a lot, but really had not had a conversation. My sister was getting emotional and I was fearful her heart rate was too high. We got her water and reminded her that we would be done soon. And then she could cry. As we turned the corner to the finish line, it was amazing! The street was lined with loud spectators! We sped up and crossed the finish line together in 4:15:13. Goosebumps, giggles, more selfies and a sense of accomplishment. We had run every step of the Boston Marathon together. Our friends welcomed us back to our hotel room with a sign that said “The Party Starts Here!”, balloons, tiaras, cannoli’s, and more selfies. Thanks for the memories! I could not have done this race without my selfie partners, my supportive family, friends and Fleet Feet Sports!